Cataclysmic variable stars (CVs) are white dwarf stars that are accreting from an orbiting, low mass binary companion star. The accretion is facilitated by the proximity of the stars; typical orbital periods range from about one to ten hours. Although the family of these exotic CV binaries is heterogeneous, there are, roughly speaking, four classes characterized by the accretion physics, eruptions caused by occasional accretion events, flaring from activity on the white dwarf's surface, and the appearance of hydrogen lines in the companion star. CVs are found in many galactic environments, but their presence in globular clusters, whose distances and populations are well characterized, allows a more precise comparative study of their properties. CVs can affect the evolution of the cluster while themselves being influenced by the dense stellar environment in a cluster. 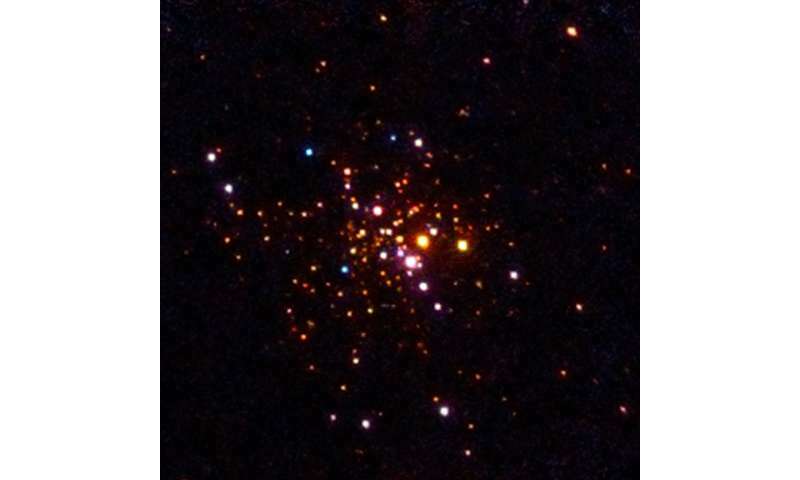 Evolutionary models of globular cluster evolution imply that after about ten billion years, a cluster with a million stars should have about two hundred CVs – many more than have been seen so far in any cluster. Identifying them, however, is not easy because they can be faint and because they exist in such crowded environments. CfA astronomers Maureen van den Berg and Josh Grindlay and their colleagues detected twenty-two new CVs in the nearby globular cluster 47 Tucanae (47 Tuc) using Chandra X-ray Observatory and Hubble measurements, bringing the total known to forty-three, the largest sample in any globular cluster so far. The scientists find that 47 Tuc has fewer bright CVs than had been expected. Many globular clusters show a steep increase in stellar density near their centers (the so-called "core collapse" scenario). The scientists argue that the high central densities in these core-collapsed clusters has led to frequent close encounters between stars, which in turn has resulted in the formation of younger and brighter CVs. The cluster 47 Tuc has not experienced core collapse, which could explain the relative lack of such bright CVs. These new results imply that the CV population in 47 Tuc is therefore a combination of primordial CVs and others formed dynamically early in the evolution of the cluster.